Once upon a time, I fell for the instant gratification lure of immediately longer and fuller lashes and got myself eyelash extensions. They looked amazing when freshly applied but when they came off – they took a bunch of my natural lashes with them. The silver lining is that thanks to this unfortunate experience, I became somewhat of an expert on eyelash growth rate issues. So if you’re currently in the unenviable position of trying to grow back lost lashes – here’s everything you need to know. The first thing you’re probably wondering is whether eyelashes grow back in the first place. I know I was terrified that my lost lashes were gone forever. Especially since I suspected my lashes had been yanked out when the extensions were removed, I was seriously worried that they’d been permanently removed. So do eyelashes grow back if pulled out? 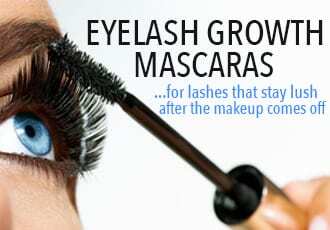 Rest assured – eyelashes grow back, even if they were pulled or yanked out. Think of it like when you pluck your eyebrows or wax your legs. You can remove the little hairs, base and all, but they still return, don’t they? Same with your lashes. So don’t worry, they will grow back. How Long Does It Take for Eyelashes to Grow in the First Place? The short answer? Quite awhile – it can take up to 200 days! Want a longer, more nuanced answer? You’ll want to know how lashes grow to begin with. Here’s how it works: Lashes begin their development in the Anagen phase, which is when the growth happens. This period lasts around 45 days (which is why it can seem like your lashes are taking forever to grow) and is the only time in the lash life cycle when they are actively growing longer and thicker. Once your lashes complete the Anagen growth phase, they enter a transition phase known as the Catagen phase. This period lasts around 2 to 3 weeks and during this time, there is no growth. In fact, the hair follicle actually shrinks during this time. The bad news is that if an eyelash falls out or is pulled out during this phase, it won’t grow back straight away because the hair follicle actually needs to complete this phase before it can move on to the next phase. The next, and last, phase that your lashes go through is the Telogen phase. During this resting period, your eyelashes are basically just chilling and doing their thing. This phase lasts around 100 days at the end of which, the eyelash will fall out and begin the cycle all over again. If you lost your lashes during this Telogen phase, you’re lucky because this is actually the best time to lose an eyelash. Why? Because the eyelash growth cycle wasn’t interrupted so it can begin anew quickly. So…How Long Does It Take For Eyelashes to Grow Back?! Don’t be discouraged by the long eyelash growth cycle – it’ll only take around 6 to 8 weeks for you to start seeing new eyelashes grow back. And of course, you can always take action to help your eyelashes grow faster. 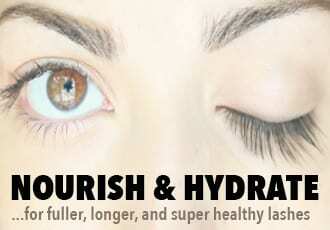 The best way to encourage faster eyelash growth is to apply a daily eyelash serum. The best lash growth serums work by extending both the growth phase of your lashes so they grow to longer lengths as well as increasing the number of lashes that sprout. They’ll help fill in a sparse lash line a lot quicker (and a lot longer and fuller). The only downside is that these super effective lash growth serums contain Prostaglandin, which has the unfortunate side effect of darkening your irises. This is fine if you have dark eyes, but if you have light-colored eyes – you’ll want to go for an eyelash conditioner instead. Lash conditioners don’t typically produce the same dramatic eyelash growth as prostaglandin-containing serums do, but they definitely help your lashes grow back longer, thicker and healthier. They also provide heaps of nourishment for your lashes and hair follicle so they stay healthy and can grow to their full potential. Omg!! Thank you for this article… it was exactly what i was looking for! The best and most comprehensive answer to my question. Absolutely AMAZING article! Thank you SO much! I have Trichotilliomania (urge to pull out hair) and I was so scared. This article saved me and my looks. I have gotten Therapy and I am completely back to normal. My 12 year old daughter suffers from trichotillomania as well. How long did it take you to recover? What kind of therapy did you get? 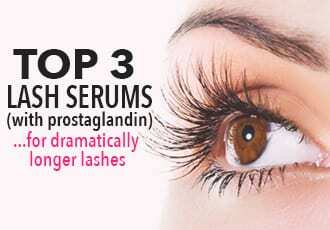 Did you use the eye lash growth serum? Any help is appreciated! I suffer from trich and found an article on pinterest about trich and taking probiotics supposedly helps. I started and haven’t had a pulling episode in over a week which is great for me. Is there anything you can do for appearance while waiting for lashes to grow back? Can you wear false strips or mascara or would you go bare until they grow back? Hi Cassidy, thanks for stopping by! Of course, it’d be the healthiest choice to leave your lashes alone and let them breathe while they grow back (apart from regularly giving them nourishment with last growth oils, vitamins and minerals, and/or lash enhancing serums). But if your lashes are really sparse and you can’t stand how bare they look, then falsies are definitely an option. Just make sure you’re picky when it comes to choosing the glue you’ll use – go for one that’s latex- and formaldehyde-free! Can you still wear makeup (mascara) during the wait as long as you take the mascara/makeup during this growing time? I mean during the 200+ days it will take for the growth period, there obviously be times when you go somewhere like when you need to dress up, and no matter how pretty what you’re wear, people will still be looking at your face! Lol. Lastly, which Castro Oil do you recommend? Thanks. So I just found this and would like to clarify some things. First, I am a licensed cosmetologist in Maryland. I had training for lash extensions and practiced diligently to put them on safely, correctly, and to look natural. Second, if you remove the lash extensions without using a remover (that breaks down the adhesive thus allowing the extension to slide right off the lash without damaging a thing) then you will absolutely damage/destroy/or pull out your lashes. Think of it like this, If you have acrylic nails on, and you rip them off vs. use somethign to soak them off – what does your nail plate look like? Damaged, right? Also ripped & torn edges. The same thing happens (kind of, this is just an analogy) with lashes. Finally, A GOOD lash extension application shouldn’t feel like anything. At all. You shouldn’t feel them on your lashes, no extra weight, no itching, no burning. Maybe you will feel them touch your eyelid when you open your eyes or feel them blowing in the breeze, but they shouldn’t hurt, annoy you, itch, burn, pull, or in any other way irritate you. If they do – you had a bad technician. Thankyou so much, I had Russian lashes applied for my holiday, they looked great at the time but apart from a stubborn few they’re fell out and my natural lashes look very different than before. I was panicking a big bit before I read this. I will never get semi permanent lashes again.